Marina Ivanovna Tsvetaeva (1892-1941) was the daughter of a Professor of Fine Arts at Moscow University, and grew up in material comfort. Her mother, Maria, was by far the most powerful presence in the household; a gifted woman, of bitter intensity, she had renounced her first love to marry a widower much older than herself. Her considerable musical talents were frustrated, and she turned all her energies towards educating Marina, her precocious elder daughter. Insistence on hours of music practice and a stern refusal of any words of praise made Marina's childhood unusually austere. When Marina was 14, her mother died of tuberculosis, expressing a passionate indifference to the world she was leaving: 'I only regret music and the sun.' After her death, Marina abandoned the study of music and began to develop her passion for literature. 'After a mother like that,' she reflected, 'I had only one alternative: to become a poet. Her mother remained in her dreams, sometimes as a longed-for, benevolent figure. In one dream, however, Tsvetaeva meets a bent old woman who whispers surprisingly: 'A mean little thing she was, a clinging one, believe me, sweetheart.' This is the witchy crone of Russian folklore, and we meet her again in Tsvetaeva's cruel fairy tale 'On a Red Horse'. By the age of 18, Tsvetaeva had acquired sufficient reputation as a poet to be welcome as a house guest at the Crimean dacha of Maximilian Voloshin. There she met her future husband, Sergei Efron, the half-Jewish orphan of an earlier generation of Revolutionaries. At 17, he was shy, with huge grey eyes, overwhelmed by Tsvetaeva's poetic genius. They fell instantly in love, and his was the most loyal affection Tsvetaeva was ever to find. They were married in January 1912. For two years after their marriage, they were irresponsibly happy together. Seryozha, as he was usually known, was an aspirant writer and a charming actor. Most people who knew Efron liked him, but some thought him too much under the influence of his wife. He was certainly weak physically - he suffered from TB all his life - but Irma Kudrova, recently allowed access to files of his 1940 NKVD interrogations, has uncovered a man of unusual courage and integrity. When war came in August 1914, Seryozha was eager to enlist, and was sent initially to the front line as a male nurse in an ambulance train. Soon afterwards, Tsvetaeva fell in love with Sofia Parnok, a talented poet, from a middle class Jewish family in the Black Sea port of Taganrog. Tsvetaeva had been wildly but innocently attracted to beautiful young girls in her early adolescence, but Parnok was well-known as a lesbian. She was not exactly beautiful, but she possessed a sexual assurance which had never been the main bond in Tsvetaeva's affection for Seryozha. Tsvetaeva was well provided for since her father's death in 1913, and for 15 months she threw herself into her passion for Parnok with little thought for her husband and two year old child. She and Parnok travelled brazenly over the wilds of Russia together and even visited Voloshin's dacha. The lyrics for Parnok are both more sensual, and less tormented, than other love poetry written by Tsvetaeva. Sergei had a brief love affair of his own. 'My mother is not at all like a mother. Mothers always think their own children are wonderful, and other children too, but Marina doesn't like little chlldren... She is always hurrying somewhere. She has a great soul. A kind voice. A quick walk. She has green eyes, a hooked nose and red lips ..Marina's hands are all covered with rings. she doesn't like people bothering her with stupid questions.. The family fared badly in the Moscow famine. Marina was unskilled at bartering trinkets for food, and she and Alya often lived on potatoes boiled in a samovar. They sometimes went out on a sledge together in the freezing cold to exchange bottle tops for a few kopeks, often leaving the younger child, Irina, strapped against a table leg to prevent her coming to harm. When starvation looked imminent in the winter of 1919-20, Tsvetaeva put both children into the Kuntsevo orphanage, which was thought to be supplied by American food aid. When she arrived on her first visit, Alya was running a high temperature and Tsvetaeva, frightened, took her home to nurse her. Alya pulled through but Irina died of starvation in the orphanage in February 1920. Tsvetaeva was unable to make herself go to the funeral. She blamed Seryozha's sisters, probably unfairly, for refusing to help her, claiming they had behaved 'like animals'. She told all her friends to write to Seryozha that the child had died of pneumonia rather than hunger. There was much gossip about her own neglect of the child. Certainly, she was never as close to Irina as to Alya. The following year was taken up by a new infatuation - Yevgeny Lann, a poet friend of her sister Asya - a humiliating rejection by him and anxiety about Seryozha as the defeat of the White Army loomed closer. In January 1921, Tsvetaeva wrote a poem of pitiless inquiry into the nature of her own inspiration : 'On a Red Horse'. The tone resembles that of her other folkloric poems of the period such as 'The Tsar Maiden' (1920) and 'The Swain' (1922) but the story of 'On a Red Horse' is not taken from Afansyev's fairy tales; it is her own invention. A handsome rider of implacable cruelty demands that all her other loves be sacrificed for him. These dream-like sacrifices do not secure his kindness, however, and an old woman she encounters reveals the bleak truth: 'Your Angel does not love you.' Released from the hope of winning his affection, she plunges into battle as a male figure. It is why I chose you. In 1922, the Civil War ended in victory for the Bolsheviks. Ilya Ehrenburg, who was always in touch with what was happening to his friends, learned that Seryozha had made his escape to Prague, where he had been offered a student grant to study at the university. He brought Tsvetaeva the news and, without hesitation, she and Alya prepared to set off into exile to join him - though it has to be said that Tsvetaeva found Berlin almost irresistibly exciting along the way. When the family was reunited, she was shocked to find how little Seryozha had changed from the boyish young man she remembered. She herself had been shattered by her experience and was prematurely grey at 30. In Prague, Seryozha was given a room in a student hostel, while Tsvetaeva and Alya lived in the village of Horni Mokropsky. At first, Tsvetaeva was welcomed in Prague as a major literary figure, but her more conventional compatriots soon turned away from her. She failed, as Nina Berberova makes clear in her autobiography The italics are mine to show the domestic graces that make poverty bearable. Men of comparable genius usually find women to take care of them. Anna Akhmatova, Tsvetaeva's only equal as a Russian woman poet, always found friends to look after her, even in old age. Tsvetaeva was less fortunate and she resented the burden of the daily round. Nevertheless, it was in Prague that she had her short, fierce affair with Konstantin Rodzevich, which drew from her some of her greatest poetry : 'Poem of the End' , 'Poem of the Mountain' and 'An Attempt at Jealousy.' Rodzevich ended the affair, and went on to marry an 'ordinary' woman with a private income. When I met Rodzevich in 1970's, while writing my biography. he was a handsome, well-dressed man in late middle-age. His wife was so jealous of him that he would only agree to meet me when he was sure she would be out. He talked of his love for Tsvetaeva as un grand amour and showed me a portrait he had painted of her which he kept in a locked drawer. Why then had he ended their affair? He attributed this to the great affection he felt for Seryozha. I was sceptical, but I was already suspicious of him. He had fought in the Red Army in the Civil War, but told the émigrés in Prague that he had been part of the White Army, a well-judged subterfuge which did not suggest he was particularly trustworthy. He had two other secrets, however, which I have only recently discovered. I knew he was an enthusiastic member of the Eurasian movement - along with Seryozha, who drew a salary from it, and my old Cambridge friend Vera Traill's husband Peter Suvchinsky. I knew, too, this became a front organisation for the NKVD. What I had not guessed was that Rodzevich was himself working as a Soviet agent. Nor did I guess that he was Vera Traill''s lover. That last is evident in an intimate and long-running exchange of letters discussed in Irma Kudrova's The Death of a Poet (2004) and throws new light on Vera's irritable dismissal of Tsvetaeva's womanliness, even as she praised her genius as a poet. Tsvetaeva has often been accused of preferring to make her closest relationships at a distance, usually inventing the qualities of their recipients. Indeed, she was locked in an epistolary romance with a young Berlin critic she had never met at the very moment she entered her affair with Rodzevich. Her important relationship with Boris Pasternak is another matter. For one thing, it was initiated by him and his enthusiasm was equal to hers. She and Pasternak had only known one another slightly in Moscow; though he was one of the poets she most admired. Pasternak wrote to her after reading a copy of Tsvetaeva's early poems, overwhelmed by her lyric genius. His words - 'You are not a child, my dear, golden, incomparable poet,' - restored her sense of her own worth. Their correspondence continued with mounting warmth, as poems and plans for poems were exchanged. She had found a twin soul. Soon he was suggesting that she join him in Berlin where he was visiting his parents. She failed to arrange the correct papers in time, and he returned to Russia without meeting her, though they continued to plan for it. In 1931, when she heard that Pasternak had separated from his wife, she seems to have experienced a kind of panic. She wrote to her friend Raisa Lomonsova: 'For eight years Boris and I had a secret agreement: to keep on until we can be together. But the catastrophe of a meeting kept being postponed.' It seems likely that she was afraid of being rejected as a woman. Her cycle of lyrics, Wires, is an extraordinary example of the poems he drew from her. Two of these appeared in my earlier selection, but both are amended here, and the other 12 are now included. The elegy she wrote for his death at the end of 1926 has been analysed with great eloquence in an essay of Joseph Brodsky, 'Footnote to a Poem' He praises the amazing energy which miraculously sustains a sequence which has the nerve, as he puts it, to open on 'High C' . In it, we are transported from the ordinary chat of the literary world to look back on the earth as if from a theatre box far out in the universe. Do you ever - think about me, I wonder ? What do you feel now, what is it like up there? Seryozha moved from support of the Eurasian movement, to working directly for the Union of Repatriation of Russians abroad. From this organization, he drew a small salary. Tsvetaeva inquired very little into the nature of this work. Her own isolation among White йmigrйs grew, and not only because of her refusal to sign a letter condemning Maykovsky's talents as a poet after his suicide. 'In Paris,' she wrote to her Czech friend Anna Teskova, 'with rare personal exceptions, everyone hates me; they write all sorts of nasty things about me, leave me out in all sorts of ways, and so on.' Sadly, she came to feel equally isolated in her own home. Alya, once so close, had begun to find it easier to relate to her father. Both Seryozha and Alya moved towards the ideals of Socialism as the Thirties developed. As soon as Alya was given a passport by the Soviet regime, she made her own way back to Russia. It was never going to be easy for Seryozha to do the same. The Soviet authorities had not forgotten that he once fought for the White Army and demanded some evidence of a change of heart ; hence, although an unlikely hit-man, Seryozha's involvement in the murder of the defector Ignace Reiss in September 1937. Tsvetaeva guessed nothing of his activities until the Soviet regime arranged for his passage back to Russia to prevent his arrest. Even when the French police interrogated her she found it impossible to believe that Seryozha was guilty of such treachery. With his departure, she no longer had any source of income. No émigré journal would publish her. Friends who had once supported her, turned their backs. She hesitated, nevertheless, even though her teenage son Georgy was eager to return to Russia. For a time she toyed with living once again in Prague. The German invasion made that impossible. By 1939, she and Georgy had little choice but to follow Efron back to Russia, as she had once followed him into exile; ' like a dog', as she noted in the journal she wrote aboard the 'Maria Ulyanova' on 12 June 1939, echoing her earlier promise. Nobody warned her about Stalin's Terror, not even Pasternak, who had met her briefly in Paris in 1935 during a Peace Conference - a 'non-meeting' she called it. In any case, that great weariness, she evoked in 'Bus', already consumed her. She found Efron had been given a small house in Bolshevo, a little way outside Moscow. Other news was bewildering. Both her sister Asya and her nephew had been arrested. Her old friend Prince Mirsky, a dedicated Communist and brilliant literary critic, had also been imprisoned. Osip Mandelstam was dead. Tsvetaeva felt lonely in Bolshevo even while her own surviving family were still with her. Other members of the household were members of the group of Soviet agents Seryozha had recruited in France. Her son, a good looking young man, enjoyed teen-age flirtations. Tsvetaeva had neither time nor energy to write more than scraps. 'Dishwater and tears,' she jotted in a notebook. The year of the Nazi-Soviet pact was a crisis. Worse was to follow. First Alya was arrested, and interrogated brutally; as a result she implicated Seryozha as a French spy. Alya was sentenced to 15 years in the Gulag in spite of her 'confession'. Then Seryozha himself was arrested. When Tsvetaeva visited Moscow, she found old friends were afraid to meet her, as a relation of convicted criminals. Even Ehrenburg was brusque and preoccupied. 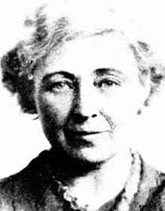 Pasternak received her without the least intimacy during a party for Georgian friends. Anna Akhmatova, however, agreed to meet her at the flat of Viktor Ardov on the Ordynka, an act of some courage since her own son, Lev, was already held in the Camps. Akhmatova never discussed what was said between them, but in later conversations she remembered reading Tsvetaeva part of 'Poem Without a Hero', noting ironically that Tsvetaeva objected to her use of figures from commedia dell'arte. Tsvetaeva read her part of her 'Attempt at a Room', which Akhmatova thought too abstract. The two women were very different creatures. Tsvetaeva did not perceive herself as a beautiful woman. She once remarked scornfully that, although she would be the most important woman in all her friends' memoirs, she 'had never counted in the masculine present.' After her affair with Rodzevich ended, she wrote poignantly to her young friend, Bakhrakh in Berlin: 'To be loved is something of which I have not mastered the art .' Yet Tsvetaeva had her own sense of grandeur. She knew herself to belong to the finest poets of her century. She did not make the mistake of blurring the distinction between serving poetry and serving God, any more than she would ever allow for poetry the utilitarian hope that Art can do civic good. In the closing passage from 'Art in the Light of Conscience' she makes that clear: 'To be a human being is more important, because it is more needed. The doctor and the priest are humanly more important, all the others are socially more important.' Tsvetaeva had written no more than scraps of journal for nearly two years. When the Germans invaded Russia in 1941, Tsvetaeva evacuated Georgy and herself to Yelabuga in the Tatar republic, just across the river Kama from Christopol where the Writers Union was housing key writers. Tsvetaeva was not denied lodging there, but she feared there would be no job for her. Her indecision was obvious to Lydia Chukovskaya, Akhmatova's friend. It may be that she heard then that Seryozha had already been shot in the Lubianka. Whatever the trigger, the depression which gripped her was deepened by Georgy's hostility when she returned to the village hut in Yelabuga. She took her own life there by hanging herself from a nail on August 31 1941.